Interest in indoor gardening is blossoming in high end kitchen showrooms, like Lion Plumbing Supply, Inc. in Miami, Florida, which are now carrying intelligent Phototron hydroponic systems under Phototron’s affiliate program. Lion Plumbing Supply is a high-end kitchen showroom and plumbing supply company in Miami, Florida. Phototron Holdings, Inc. (OTCBB: PHOT) (OTCQB: PHOT), the Los Angeles hydroponic grow box company behind the “grow your own” revolution, today announced that Lion Plumbing Supply, Inc., a high-end kitchen showroom and plumbing supply company in Miami, Florida, has joined the company’s growing ranks of exclusive resellers of the Phototron hydroponic grow systems through Phototron’s affiliate program. “I first saw the Phototron hydroponic grow system on the Martha Stewart Show, and it struck me as a logical first step toward the kitchen of the future and, better yet, perfect for our customer base,” said Paul Gentile, president and co-owner of Lion Plumbing Supply. “I hear people’s concerns about food safety and its lack of nutritional value all the time. California-based Phototron Holdings, Inc. is a leading designer and manufacturer of state-of-the-art, turnkey, indoor hydroponic growing systems capable of cultivating full size herbs, vegetables, flowers and fruits faster and stronger than conventional farming methods. Developed over 20 years ago in conjunction with NASA engineers, the company recently released three new Pro-Series Phototron units incorporating the latest in fluorescent and LED lighting technologies. These new designs harness the best of solar functions for faster and stronger plant growth. In addition to its new light designs, the Phototron touts a newly released ECO-Brain Home Hydroponic Automatic Environment Controller that takes the guesswork out of indoor gardening, thus creating a revolution in modern-day agriculture. Phototron believes smart systems make the indoor growing experience less cumbersome and more rewarding. Phototron’s patent pending Eco-Brain does all of these things automatically. This “set it and forget it” system not only tends the crops and optimizes plant growth, it teaches indoor gardeners how to grow with onscreen alerts and red alarm lights. 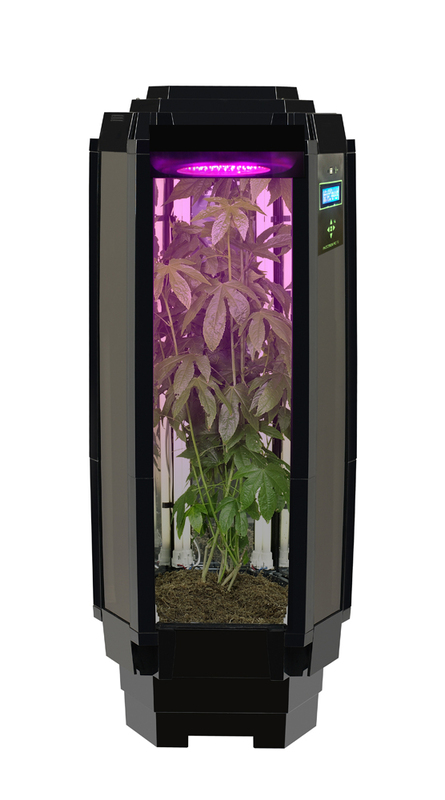 For more information about indoor growing, or to purchase or inquire about carrying Phototron products, call (800) 651-2837 or go to http://www.phototron.com. Phototron Holdings, Inc. (OTCBB: PHOT) (OTCQB: PHOT) designs and manufactures cutting-edge indoor mini-greenhouses capable of year-round growth of herbs, vegetables, flowers, fruits and medicines, better, stronger and faster than traditional farming methods. The Phototron Hydroponic Indoor Grow System, commonly called grow boxes, is built upon decades of research on the optimal temperature, light, water and nutrient needs of plants. The Phototron System uses proprietary lighting that mimics the sun's rays to grow nutrient-rich, pesticide-free, eco-friendly crops faster and in more bountiful quantities than those of traditional gardening methods, resulting in fruits and vegetables of superior taste and quality. Phototron systems and accessories are available for purchase from their website. Phototron supports the sale and use of its products to the home medical marijuana market where compliant with applicable laws. Phototron also supplies a full range of parts, accessories and advanced nutrients to more than 50,000 customers. For comprehensive investor relations material, including fact sheets, presentations, conference calls and video, please go to phototron.com. Phototron A Phototron allows people to grow their own food without the use of pesticides and take fruits, herbs and vegetables directly from the plant to the plate. Phototron’s vertical light emitting diode (LED) system, which produces only the red and blue spectrums that the plants need to grow, cost on average only 20 cents per day to operate. Phototron's Pro Hybrid model features both fluorescent and LED lighting, ECO-Brain, which automates lights and monitors temperature and moisture levels, and a built-in carbon filter.